Over the past decade, no state has grown faster than North Dakota. It leads in GDP growth and personal income growth, and it has a wide lead in oil production growth. So how did one of the coldest, flattest, least populated states in the country become an economic hot spot? Oil was discovered in western North Dakota in the Bakken formation in 1951, and for a long time there's been a limited amount of drilling in that part of the state. Until recently, the technology didn't yet exist to extract most of the oil trapped between rocks -- shale oil -- at an economical cost. In the early to mid 2000s, companies such as Halliburton developed the technology to extract both oil and gas from shale plays economically, unlocking energy plays across the country. 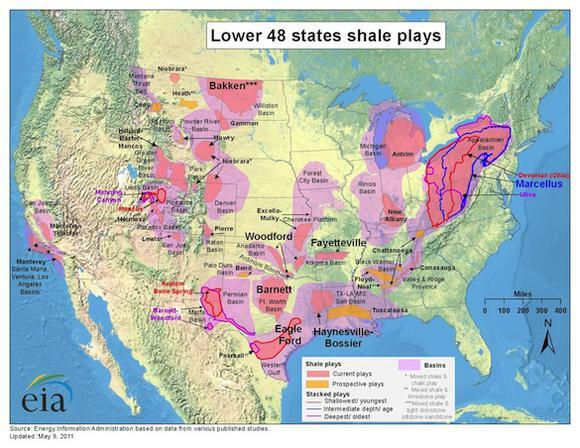 One of the largest plays in oil was the Bakken Shale in western North Dakota and eastern Montana, and companies flooded in to pick up as much land as possible. Today, Continental Resources , Whiting Petroleum , Statoil , and Kodiak Oil & Gas have access to nearly 2 million combined acres ,equivalent to 1,280 square miles. They're dotting the plains of western North Dakota with drilling rigs and production wells. All of this drilling has led to massive growth in oil production, which brings economic development and jobs to this once forgotten state. For a visual showing how fast oil production grew, click here to see a 25-year EIA time lapse of energy production in the Bakken. All of this oil production has been fabulous for the economy and the residents of North Dakota. Over the past decade, North Dakota's GDP has grown at an annual rate of 4.04%, which compares with 0.54% nationally. Only Oregon can compare, with 3.36% growth. Every other state in the country has grown at a compound rate of less than 2% over that time. The explosion in GDP growth hasn't been enjoyed just among the oil big wigs: There's been huge growth in personal incomes as well. 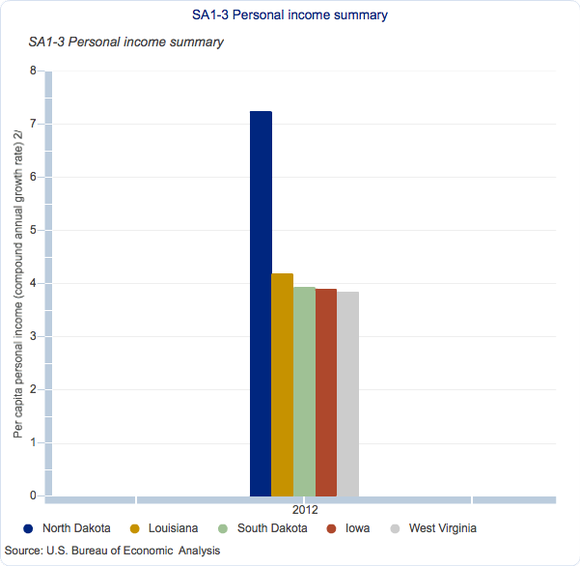 According to the Bureau of Economic Analysis, since 2005 per capita personal income has grown at a compound rate of 7.25% in North Dakota, which is more than a 50% increase in salary over six years. That compares with just 2.69% in the U.S. and 4.19% in second-place Louisiana, which also benefits from the growth in oil production. Here's a look at the top five states for personal income growth since 2005. 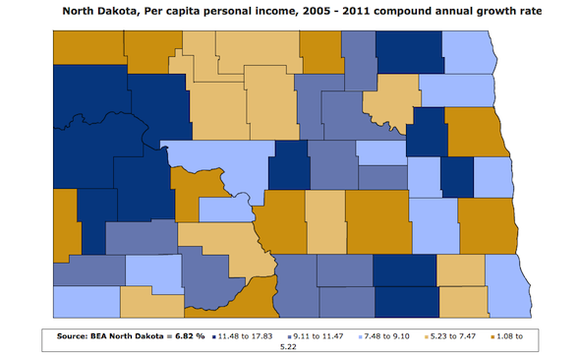 Amazingly, there are 11 counties in North Dakota that have seen per capita personal income grow 11.48% or more per year over that time, nearly doubling salaries. If you're interested in one of these high-paying jobs, you might have to find a home on the prairie, because Fargo, the state's most populous city, sits in the southeastern part of the state, in one of the slowest-growing counties from an income perspective. The jobs, and the money, are out west, where the oil is plentiful. As long as oil prices remain over $80 per barrel, the drilling boom should continue in North Dakota. The state has a plethora of resources, and explorers are expanding reserves all the time. As technology improves, even more of this oil and natural gas will become economically profitable to extract, keeping the economy of North Dakota red hot. There are many different ways to play the Bakken and the energy sector in general, and The Motley Fool's analysts have uncovered an under-the-radar company that's dominating its industry. This company is a leading provider of equipment and components used in drilling and production operations and is poised to profit in a big way from it. To get the name and detailed analysis of this company that will prosper for years to come, check out the special free report: "The Only Energy Stock You'll Ever Need." Don't miss out on this limited-time offer and your opportunity to discover this company before the market does. Click here to access your report -- it's totally free. The article This State Quietly Became an Economic Powerhouse originally appeared on Fool.com. Fool contributor Travis Hoium has no position in any stocks mentioned. The Motley Fool recommends Halliburton and Statoil. Try any of our Foolish newsletter services free for 30 days. We Fools don't all hold the same opinions, but we all believe that considering a diverse range of insights makes us better investors. The Motley Fool has a disclosure policy.